Talk with your child’s doctor. If you notice unusual behavioral symptoms that you think may be OCD or another disorder, tell your child’s doctor or pediatrician. He or she should be able to give you information about a psychologist or other qualified mental health professional who can evaluate your child or teen. Because not all professionals are trained and experienced in conducting CBT with children, it’s important to find a cognitive behavior therapist who is. In many cases, this will be a psychologist with a Ph.D., Psy.D., M.A. or M.S. degree, or a specially trained social worker. It’s also important to ensure that the therapist is willing to conduct treatment outside the office (e.g., in the school setting or home), via telephone or Skype, if necessary. If your child is diagnosed with OCD, insist on Cognitive Behavior Therapy (CBT). Don’t agree to traditional “talk therapy” or other unproven “alternative” treatments for OCD. CBT therapy is recommended by nationally-recognized medical authorities such as the American Academy for Child and Adolescent Psychiatry, the National Institutes of Mental Health, the Mayo Clinic and Harvard Medical School. 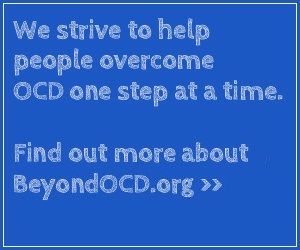 Beyond OCD can help you find a therapist. Be involved in your child’s recovery process. Your child or teen will work hard during CBT sessions with the therapist and will be expected to complete assigned “homework” between sessions. In most cases, you’ll need to be involved in scheduling homework assignments and making sure your child completes them. Find out the best way to communicate with the therapist (e.g., phone calls, emails), so he or she can provide you with feedback regarding how to best assist your child. Encourage your child. Motivation and encouragement will help your child or teen be successful in gaining control over OCD. Whether working out a schedule for completing CBT homework, juggling CBT assignments with school work, or relaxing your expectations about your child’s involvement in normal household chores, you can make a significant difference in your child’s attitude toward recovery. Remember, too, that your child likely will become frustrated, tired or discouraged at times during the CBT process. Your understanding and faith in his or her ability to succeed will help him or her get through the difficult times. Talk with your child’s therapist about how to balance empathy and firmness during the treatment program. Avoid accommodating OCD behavior. Parents and other family members frequently become involved in a child’s or teen’s compulsions. And it’s not difficult to understand why they do. Seeing a child experience emotional pain can be very difficult for family members. In some cases, parents often just “give in” to keep peace in the home. Unfortunately, accommodating your child’s rituals (e.g., completing rituals for them, providing reassurance, answering repetitive questions) only serves to reinforce them and can make OCD worse. Many therapists regularly involve family members in CBT and teach them how to stop accommodating OCD behavior. Talk with your child’s therapist about how you and your family can help – and not hinder – your child’s recovery.